Stubborn, scheming, versatile, segueing between ecstasy and desolation, between a mythic raas leela and a modern day bar stool in the East Village, the heart in Subhashini Kaligotla’s poems is a slippery, politically incorrect shape-shifter. Combining wry honesty with delicate poise, the poet invokes the age-old theme of desire --its delirium, indignity, desperation and capacity for sudden, unbidden equanimity. Crafted with a capacity to calibrate the many subtle textures of longing, these are poems of precision, strength and radiant surprise. This radiant poetry collection navigates the seismic journey of the heart across continents, time and legend. What does it mean to be faithful? To belong to a city, a country or a lover? Kaligotla employs a steely eyed precision as she tunnels into these vast questions. Bridging the silences in the great Ramayana and the lonelinesses that great diasporic artists bear, she’s able to unlock new insight into what it means to make a post-modern home. A gorgeous read! all muscle and sinew, flesh vital as grapes. on my boys, my gardenias, my goblets. Now so many things desert me. the point? Body is a dead end. Obscene. ponderous in the muddy light. except to keep asking for more. bare-chested boys in ruffled shirts. From "Bird of the Indian Subcontinent" by Subhashini Kaligotla (The (Great) Indian Poetry Collective, 2018). 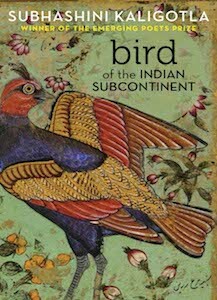 Reprinted with permission of the author and The (Great) Indian Poetry Collective. is normal in a young poet. Forgivable. to abdicate the self and its small desires. to love? Like the unweaned. Afraid. I can go on loving selfishly. How like a mad politician railing against the auslander. Keep him out, keep him out, she hollers. Protect this sacrosanct. Smash that minar and stanch his lust, let it not grow like a rogue in this soil. O, stop, stop, stop this pollution. Offer fire-flower and camphor to the four directions. Where’s the holy water? Let it wash down from the mountain, flow from matted locks... O, protect this Hindu woman from the Muslim invader. and glamour of Christmas trees. In the late afternoon I survey your estate. I retrieve from a distant place. Gulmohar. the world is yellow, the stars must be this yellow. on the main road and its arteries. Like the imported dog and his trainer. stay—good—as he pushes the animal to the ground. who keeps the world and who loses his place. a single solar lamp lights the path. The air is humid and the flagstones wet. The house is empty and the birds quiet.